As custom demands, a child cannot go home to do something without first consulting the elders for an advice, support and wisdom, if only such a child wants to succeed. It is in line with this that, barely 8 days into office, the Upper East Regional Minister Ms. Paulina Patience Abayage has paid a courtesy call on three Paramouncies in the Kassena Nankana Municipality. The call was to thank them for the moral support given her during her vetting. She is the first female to be appointed to steer the affairs of the Upper East Region as a regional minister. It was also to announce her plans to the Traditional Authorities and asked for support in her bid to develop the region. She was accompanied by the Deputy Regional Minister, who is also the MP for Zebilla constituency, Frank Fuseini Adongo, the Regional Coordinating Director, Chief Mohammed A Azonko, and the Upper East Regional Police Commander, DCOP Osei Ampofo Doku among others. The Minister’s first point of call was at the palace of the President of the Upper East Regional House of Chiefs, the Paramount Chief of the Naaga Traditional Area, Naba Bosingo Olando Ayamga Awuni III. Ms. Abayage said she was coming home as daughter of the soil, carrying the mantle of Nana Addo’s vision of development to the region. She outlined a number of the President’s social interventions including the Planting for Food and Jobs, One-Village One-Dam 1V1D, animal husbandry, and guinea fowl rearing among others. These policies, she noted, are pro-poor interventions that the region can tap into to improve the living standards of the people. She indicated it was heartwarming that, in the budget read, the Navrongo-Kologo-Naaga road has been given out on contract and the contractor will soon be to site. Ms. Abayage assured the Paramount Chief her outfit’s readiness to bring home the region’s share of the national cake, adding that all she needed was the support of the traditional rulers in the region. In his response, Naba Awuni III was grateful to the President for appointing his daughter as the first female Regional Minister. The chief called on the Upper East Regional Police Command to intensify their patrols on the Bolgatanga-Sirigu-Naaga road. His call follows a robbery attack on women traders on the road. 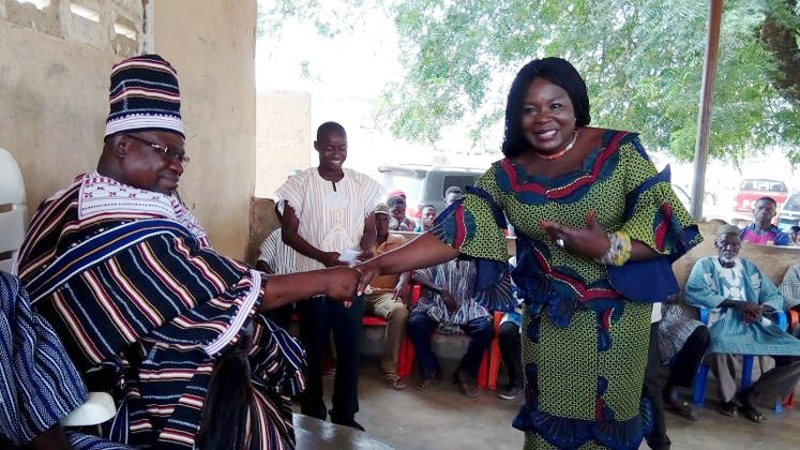 The Paramount Chief assured the Minister of his support and advised her to stay focus on her developmental course and be mindful of detractors. The Minister visited the Naaga Primary school upon the Chief’s request where she donated an amount of Five thousand Ghana cedis towards the renovation of the school. At Kologo, the Minister’s massage was not different. The Paramount Chief of Kologo Traditional Area, Naba Clifford Asobayire Abagna IV, expressed his happiness for seeing his former teacher visiting his palace as a Minister. Naba Abagna appealed to the Minister to renovate his traditional council which is deteriorating, revealing that when the contractor commerce work of the road, care should be taken of the bridge. The Regional Minister reiterated the government’s commitment in making all the roads in the country motorable. The Minister ended her visits to the Paramount Chiefs in the Kassena-Nankana Municipality at the Navro Pio’s Palace. Ms. Abayage re-echoed the need for all the Traditional Authorities in the Region to help President Nana-Addo’s vision of enhancing the living standards of the people come to reality. Pe Denis Belinia Aniakwa Adda Asapare II, Paramount Chief of the Navrongo Traditional Area advised the Minister to be circumspect in the discharge of her duties and should not forget to call on him for council when the need arises, adding that he and his subjects will support her in every sphere of life to succeed. Ms. Abayage shared how she intend to relate with the people in order to deliver her goals.